Bashundhara Kings stormed into the semifinals of Independence Cup as they thrashed Rahmatganj MFS by 3-2 goals in the quarter-final in tie-breaker after the match was stuck at 2-2 goals each in regulation time at Bangabandhu National Stadium in the capital on Friday. Bashundhara Kings goalie Anisur Rahman Zico single handedly took the team into the semifinals saving three penalties in the tie-breaker. Kings super-stars Daniel Colindres and Baktyiar Duishobekov scored one each to make sure that the match goes into tie-breaker. Rahmatganj went ahead on the 25th minute courtesy of sloppy defending by Bashundhara Kings as Rahmatganj local midfielder Md Jamal Hossain utilised a goal-line mistake and scored his first goal of the match. Rahmatganj's midfielder Rakibul Islam's shot at post was fended away by Bashundhara goalie Anisur Rahman Zico. The deflection was cutback to Jamal by Md Enamul Islam and Jamal blasted the ball into the nets while Zico remained grounded. Bashundhara Kings wer close to restoring the parity as Kings defender Nasir Uddin could not connect his header on the 41st minute. Moments later, Nasir's precise header from a corner was once again gloved to perfection by Md Titumir Chowdhury. Bashundhara forward Alamgir Kabir Rana could not utilise a goal-line mayhem and headed straight to Titu in the next minute. Following the goal Titu executed a despicable plot to earn a foul. Temperatures ran high in the field for a while. The match came back to life for Bashundhara Kings in the second half as their prized recruit Daniel Colindres came into the field. In the 67th minute of the match Bashundhara Kings finally levelled the score-line with a sensational goal by Daniel Colindres as his right-footed shot from the right wing pierced Rahmatganj's post. Kings' midfielder Nayeem Uddin sent a brilliant pass through to Colindres as Daniel proved his worth with the brilliant goal. Moments later, Rahmatganj once again took the lead with a brilliant goal from Faysal Ahmed whose perfect shot on the run kissed the gloves of Zico but managed to fly into the deadly angle. Kings forward Nayeem could not materialise yet another opportunity on the 75th minute as his shot was fisted away by Titumir. In the extra-time, Bashundhara Kings dynamic forward Baktyiar Duishobekov's glancing header saved Bashundhara from sure destruction with a sensational goal off a cross from Daniel Colindres. The match went into tie-breaker as none of the teams managed to break the deadlock. 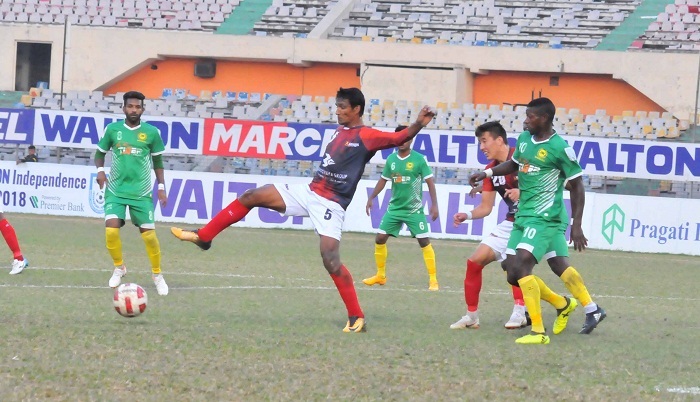 Bakyiar scored in the first penalty while Masuk Miah Zony and Emon Mahmud Babu missed. Faysal Ahmed of Rahmatganj managed to score for Rahmatganj. It was upto Nasir to deliver and he stepped up to the occasion along with Colindres who also scored. On the other side Kings goalie stopped defended three shots from being turned into goals.